Out-of-pocket money for new tires obviously matters to you as an equipment owner. And your most trusted tire supplier will work with you to look at a range of quality vs. price options to meet your needs: tread depth, ply rating, sidewall gauge and more. The tires on your skid steer loader contribute to your productivity and profitability in a big way. So, give them serious consideration. Choosing a low-price option may seem like a good idea at first, but there is a price to be paid when you cut corners on quality — a price that usually shows up as expensive downtime and a shorter service life that costs you in the long run. Take a smart, big-picture look at all of your options and the real cost of each. Not much mystery here. Of course, (B) is the truth. “There's a lot to consider for a buyer, so we train our sales representatives to dig deeper — to go back to the last set of skid steer loader tires a contractor owned,” said Eric Hartzler, wholesale manager at MWE. “It's important to know if they had uneven wear, separations, sidewall damage or other problems before recommending a replacement. Sometimes a past issue is driven by improper maintenance or the wrong tire for the tasks at hand. “Suggested tread patterns, tread depths, ply ratings, weight load capacities and other factors really come down to each person's working conditions and job performance goals,” said Hartzler. Another set of pneumatic tires may or may not be your best option. As your work demands, you might want to consider solid or foam-filled tires. The likeliness of having a flat tire, especially operating in or around construction sites, can be rather high. All it takes is one shard of metal or bolt to puncture your tire to shut down your skid steer loader. And, idle time can cost you. Solid tires eliminate flats. If the type of work you do isn't a good fit for solid tires, you should still take the time to determine what pneumatic tires will give you the longest life. 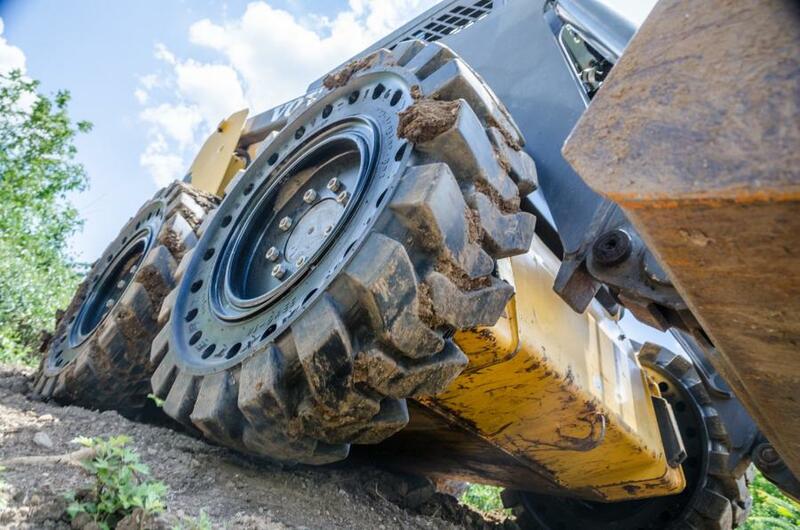 Looking at tread depth, rubber compound strength, sidewall thickness and other factors will help you project the likelihood of avoiding costly punctures and flats on job sites. Based on the initial cost of each tire, you can calculate the multiple costs involved with a tire failure: lost machine billing time, cost of repair or replacement, number of workers who would be left idle — and their average hourly wage. A tire that costs 20 percent more may, in fact, have the needed construction and strength to last 50 percent longer than a less expensive option — lowering your cost per hour of operation. “A knowledgeable tire professional always the best place to start when weighing your skid steer loader tire choices,” said Hartzler. “Especially if they offer multiple brands and lines of tires, they can give you a variety of good-better-best options that fit your needs and budget. The next time your skid steer loader is due to have a set of tires replaced, take the time to calculate the total cost of investment instead of focusing too much on the initial sticker price. The true cost — your complete out-of-pocket expenses over the service life of the tires — will be dictated by their length of service and damage/downtime (suffered or avoided) along the way. Only then will you know the real ROI from your investment.